I realised that I must have been keen for this one when race number 2 was handed over to me at registration. Anyone who’s run with me for any period of time would agree that letting me run with #2 is very appropriate – Kevin Costner was ‘Dances With Wolves’ but, if I earned an Indian (or I guess that should be Native American) running name, it would probably be ‘Sits in the Bushes’. 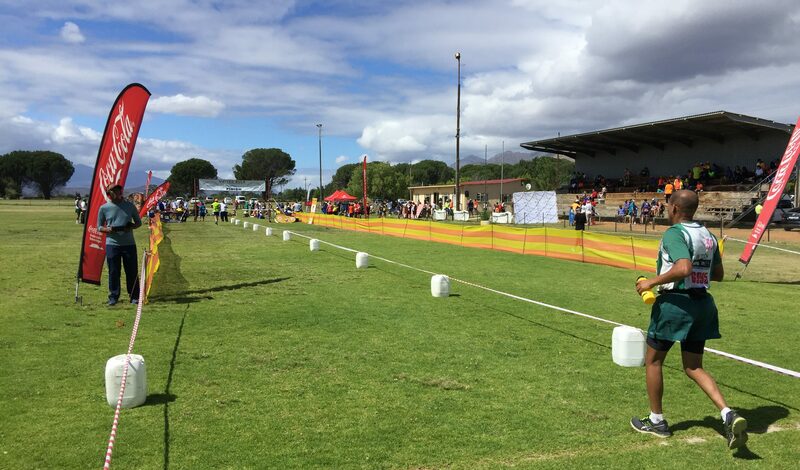 The race is organised by the Brandvlei Correctional Service Athletic Club and I asked the warder on registration duty whether anyone famous was incarcerated in his prison. He said no household names but the facility provides long-term accommodation for ‘most of the people you read about in the paper’. He did add that Jacob Zuma* was ‘almost imprisoned here’ – but it was not clear whether this was during his struggle days or more recently. * Interestingly there used to be a JG Zuma race in Greytown, Kwazulu Natal. It was cancelled last year (due to lack of funds) and is doubtful to return in future. However, JG Zuma would make a great patron for the Prison to Prison Marathon. Jacob Zuma, perhaps the most highly skilled kleptomaniac of his generation, recently hired a PR firm and turned to Twitter in an attempt to rebrand his image from that of a serial sexual predator hell bent on corrupting every single public institution in South Africa into that of an affable old buffoon. For my tax money, seeing his smiling face chuckling away from behind a heavily fortified fence would be the best way to improve his image – and would bring a huge amount of joy to many South Africans. 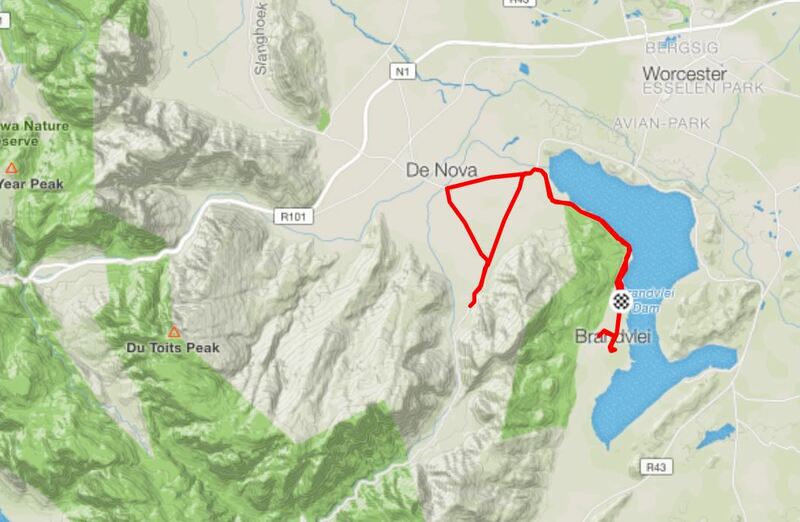 An out-and-back route (with a triangular deviation) nestled into the mountains. 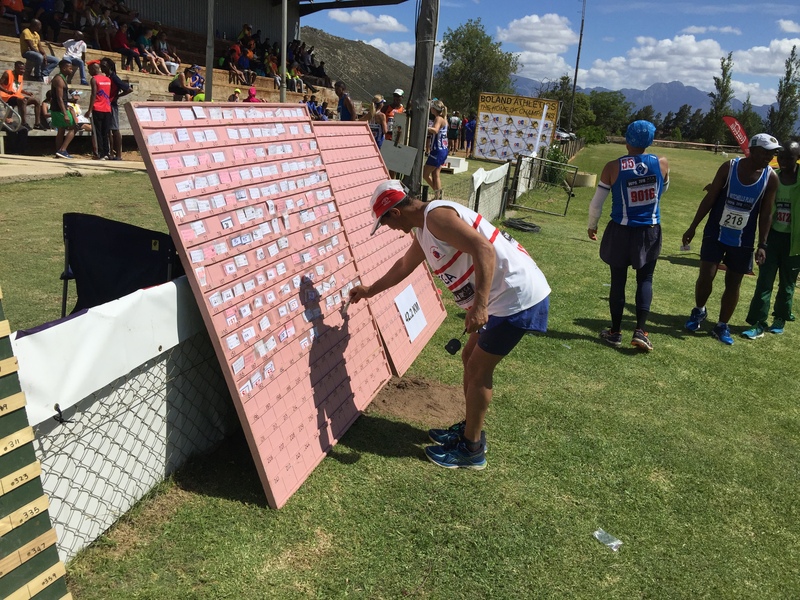 The race was named “Prison to Prison” because the original route ran you from the Brandvlei to the Worcester Prison and then back again. 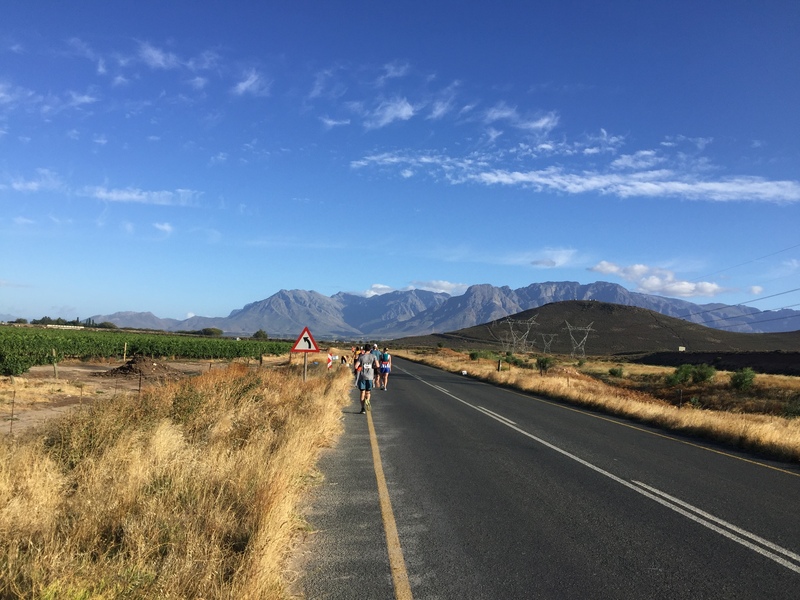 Increasing traffic in town has meant the route needed to be changed so now you avoid Worcester – but the upside is that you get to take in some spectacular Boland scenery. 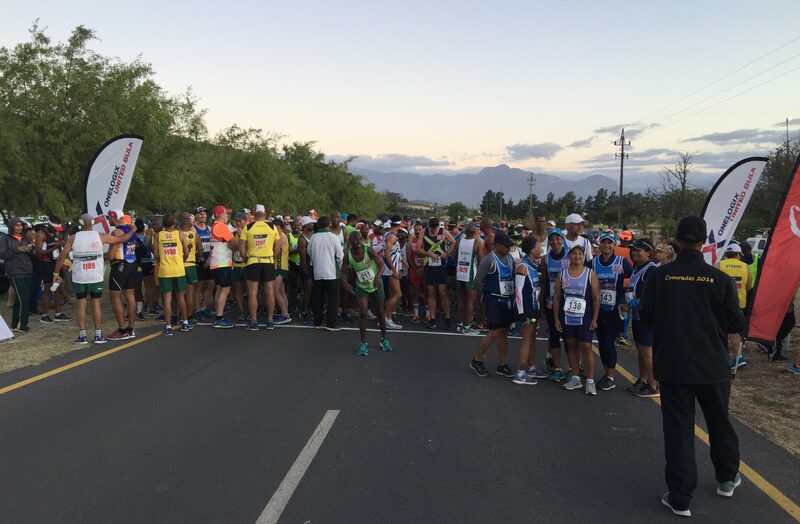 I was expecting a very small field and was surprised to see a prison line-up of over 400 other marathon runners shortly after sunrise for the 5:30am start. 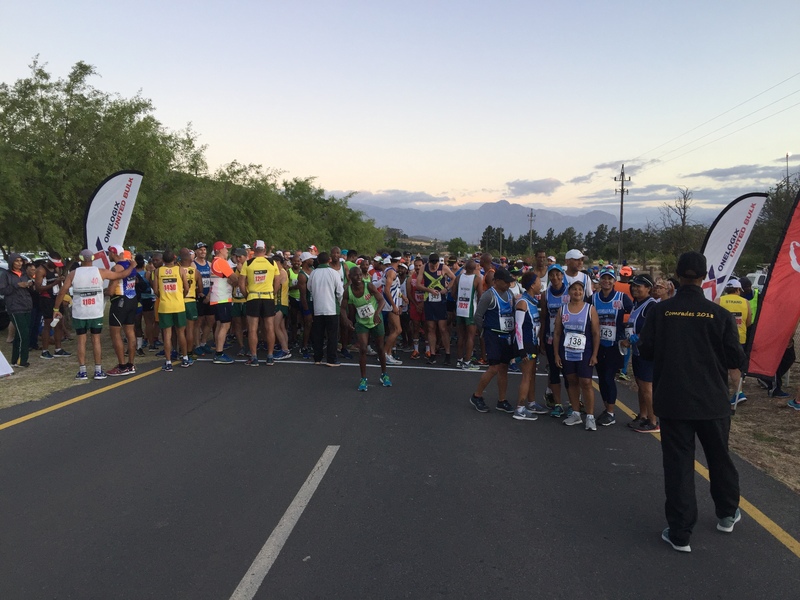 Over 400 runners line up for the Prison to Prison Marathon. I guess the firing of guns is problematic on prison grounds, so our jail break got going with a simple, “Ready, steady – GO!”. You set off on a decoy run deep into the prison grounds which provides one with a full tour of the facility – although you don’t see much of the prison proper other than high, electrified fences. Our decoy run into the depths of the prison grounds. After 7km you find yourself back at the start line and can enjoy being cheered on by a couple of hundred half marathoners* waiting for their 6:30am start. * Brandvlei has maximum, medium and juvenile security units. Likewise, the race has a marathon, half marathon and fun run. 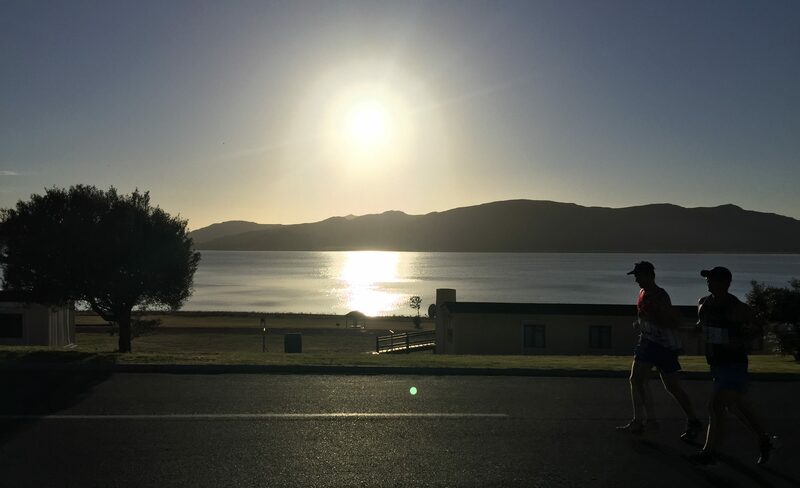 The sun rises over the Brandvlei Dam. 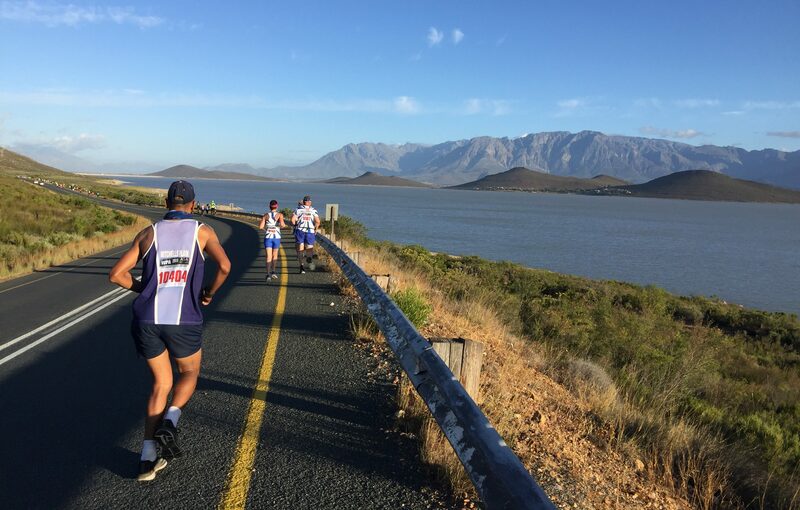 You now enjoy an 8km trot alongside the Brandvlei Dam, home to some of the best smallmouth bass fishing in the country. 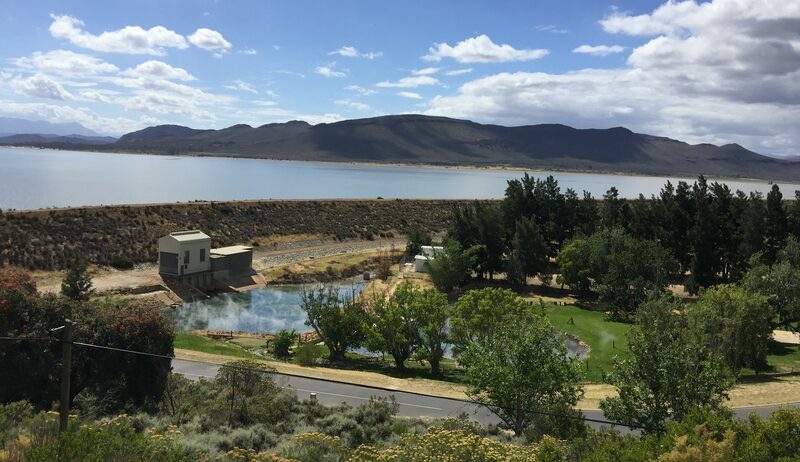 Brandvlei translates as ‘Burning Marsh’ and is so named for the resultant smoke on the water from hot springs beneath the surface. The burning marsh shows up quite spectacularly in the early morning sunlight (but unfortunately a lot less spectacularly with my photographic skills). 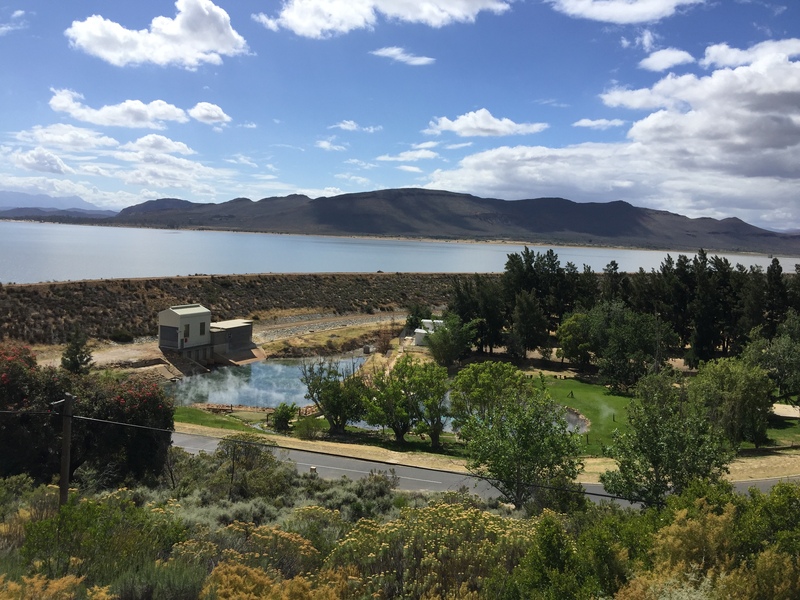 The hot springs result in smoke on the water, giving the Brandvlei Dam its name. 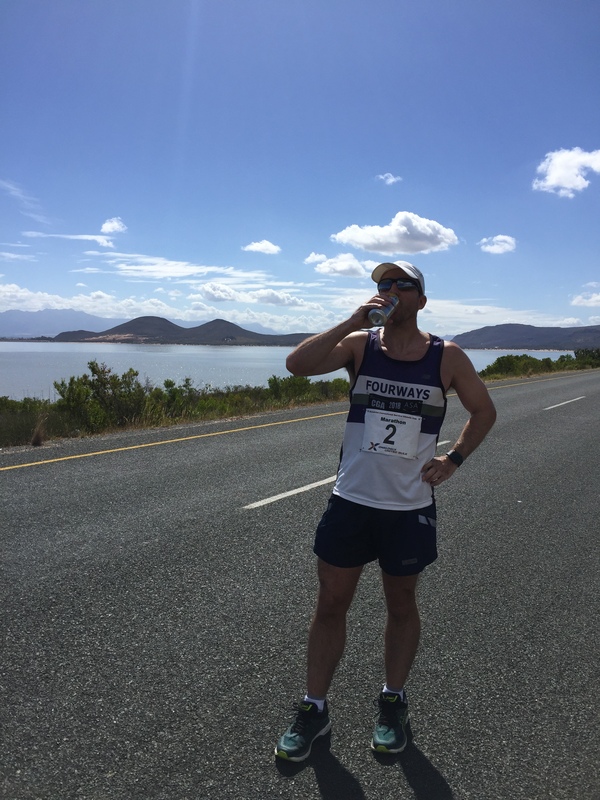 Enjoying the stretch alongside the Brandvlei Dam. 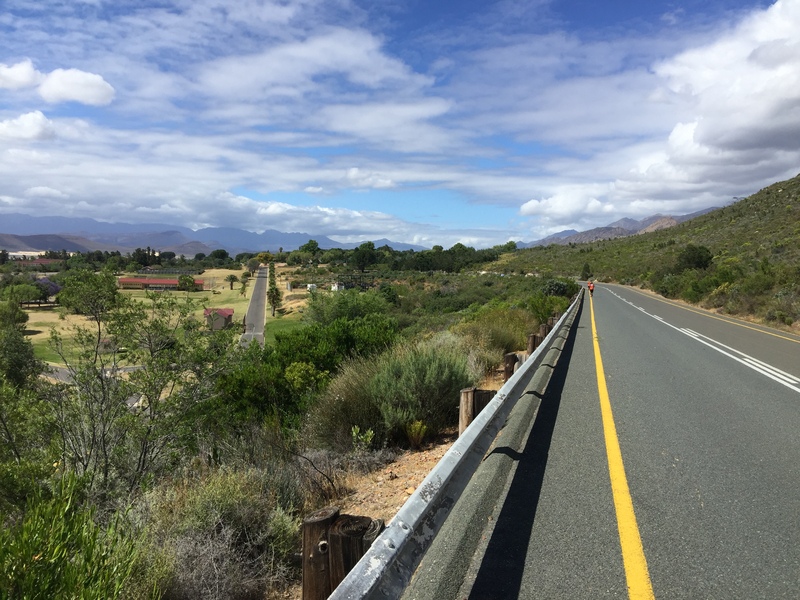 At the end of the dam you hit a T-junction and turn left towards the Du Toitskloof Mountain Range. Without the dam to distract you, the spectacular mountainous surroundings now take centre stage. 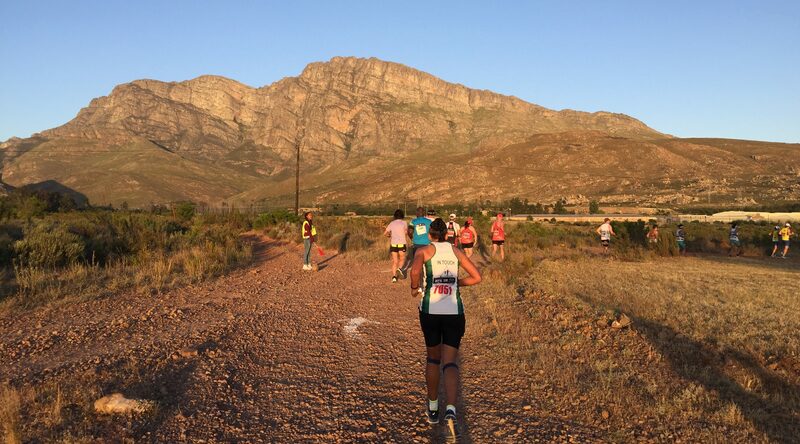 Most races with spectacular mountain views require spectacular mountain climbs. However, the Prison to Prison Marathon gives you all the views with none of the pain. 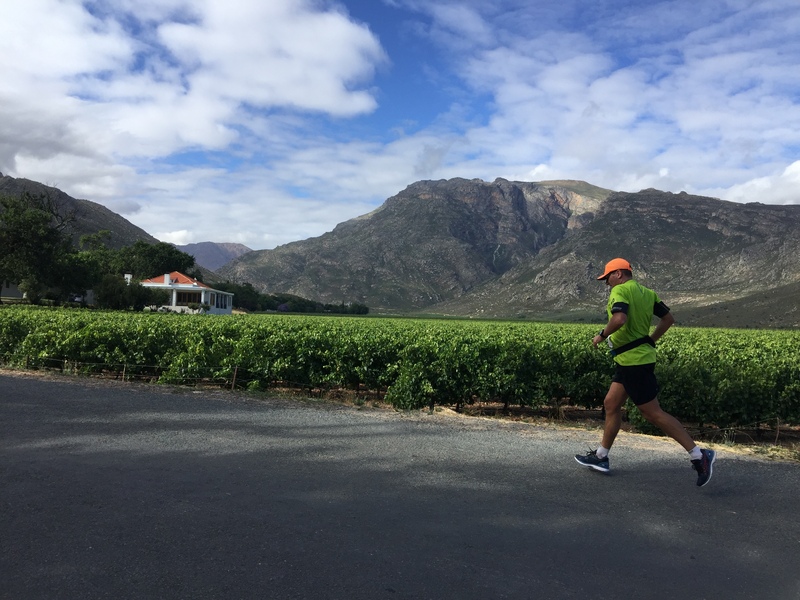 The organisers have managed to nestle the entire route into the Breede Valley surrounded by the constant vista of the Du Toitskloof, Stettyns, Hex River and Slanghoek Mountains – without taking you up any major hills. All the views with none of the pain. Now some of you may look at the route profile and say, “Hang on a minute, it looks like there is a massive hill from the 15km mark!”. 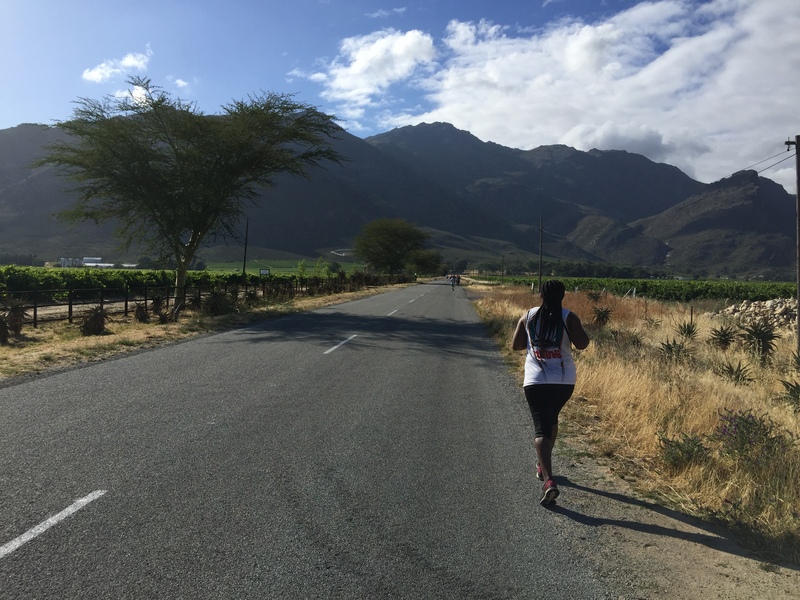 This is in fact a very gentle climb of 75m over 11km – which definitely still secures a “fast-and-flat” difficulty rating by South African marathon standards. Aside: Your Flat or Mine? 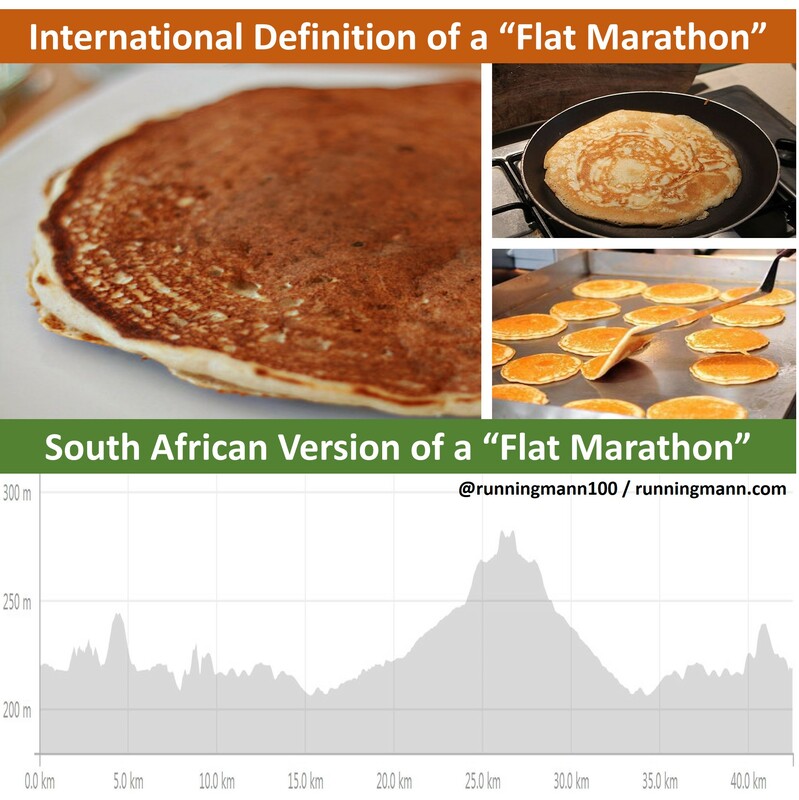 * 203m of climbing puts Prison to Prison in the flattest 5 – 10% of South African marathons by my calculations. Running next to next year’s vintage. 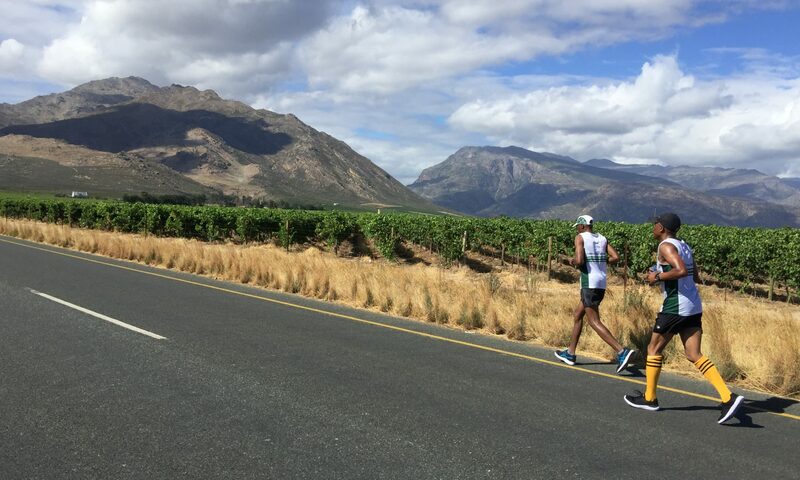 The Breede Valley is one of the largest wine growing regions in the country and the middle section of the race takes you passed several of the vineyards in the area. 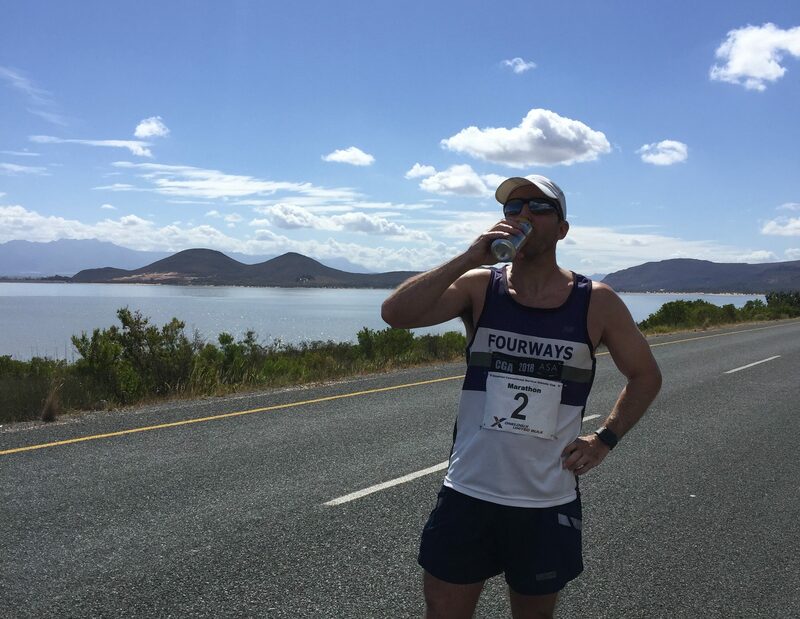 It can get a little hot during this section so it’s important to keep well hydrated – and with the KWV Brandy Distillery (the largest in the southern hemisphere) nearby, runners in low spirits may be tempted to add a little stimulant to their Coke. I mentioned that it always good to bump into Shawn Combrink during a marathon – but it’s even better to bump into his support crew. These days, Shawn needs some extra encouragement over the last half of a marathon: So his support crew typically do the half marathon, drive around the course to locate him and then dangle a gold karot (in liquid form) in front of Shawn for the remainder of his marathon. 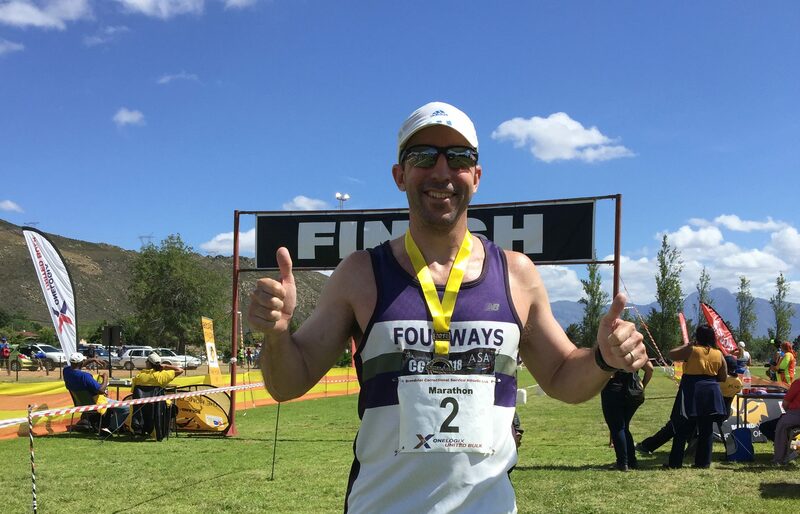 It is difficult to discern whether they yell “Shawn Combrink!” or “Shawn, come drink!” but this tried and tested method makes sure he crosses the finish line every time. I obviously looked like I needed a little enticing myself and gratefully accepted a break from Coke and water. Always good to bump into (and accept a little personal seconding from) the Shawn Combrink support crew. 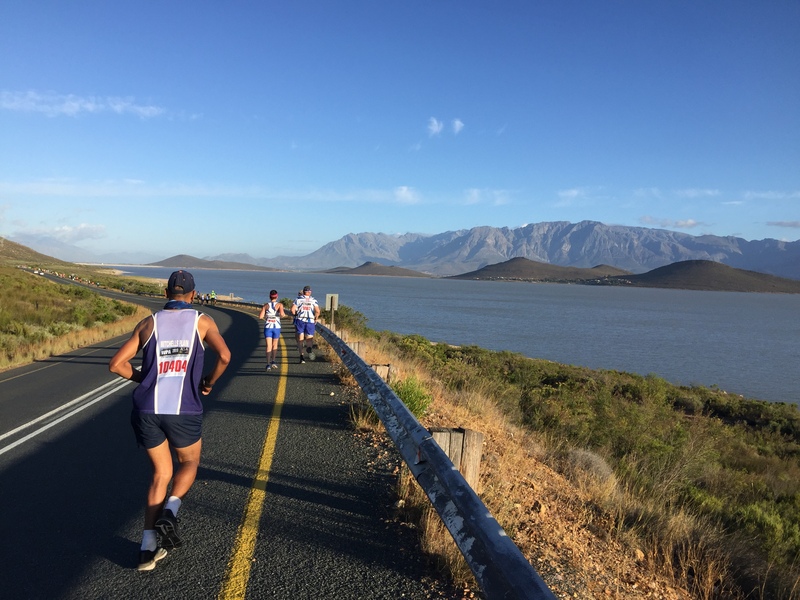 With 8km to go, the Brandvlei Dam comes into sight again and it’s not long before the prison gates loom ominously above – this nasty little pull does indeed classify as a hill. One short hill gets and you are back in prison. However, once you are back inside, the climb rewards you with a great aerial view of the prison grounds, dam and hot springs (and you can be forgiven for thinking that you are in a holiday resort rather than a penitentiary). A holiday resort or a maximum security prison? From there it’s just the simple matter of negotiating the gentle 2km drop to the finish line on the prison’s sports fields – and I was pleased to be awarded my parole in just over 4 hours. Just about to earn parole at the Prison to Prison Marathon. In addition to the medal, I was handed a credit card sized plastic envelop with “181” written in black marker and tried to figure out what this was for. It turns out that they still use old school methods for their results in this part of the world – you put your entry tag inside the plastic envelop and then slot this onto a big wooden board for a very efficient self-service results method*. 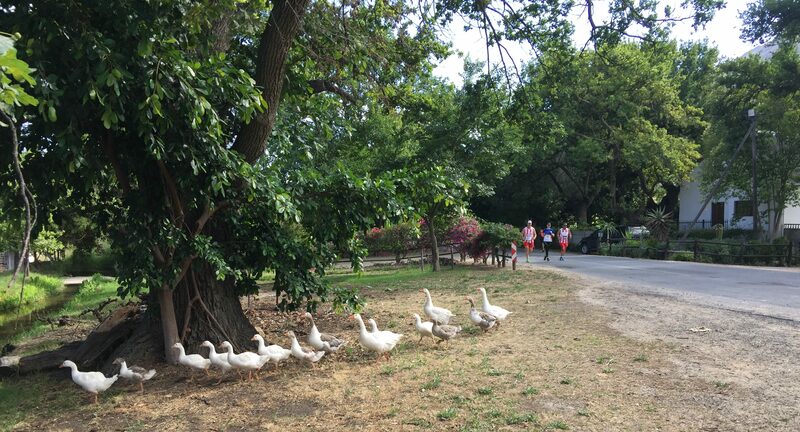 * This method has resulted in some confusion for migratory up-country runners (and years of no official results in the most extreme cases). 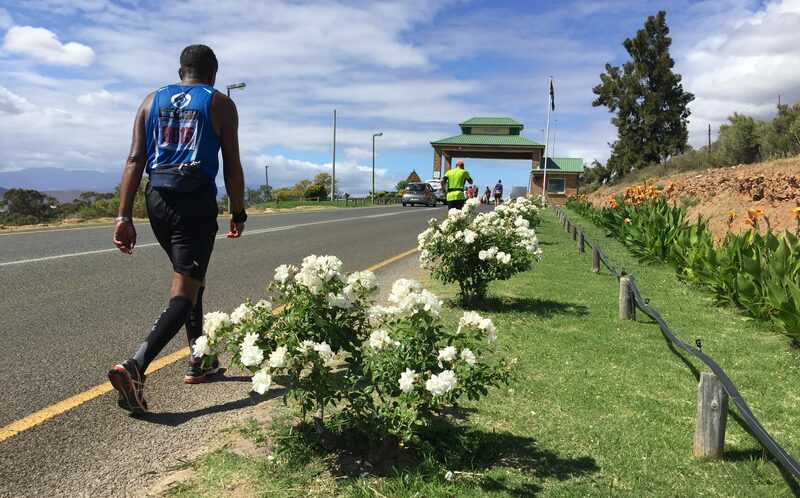 The Prison to Prison Marathon adds to the collection of stunning Boland races and is definitely worthy of a bucket list update. 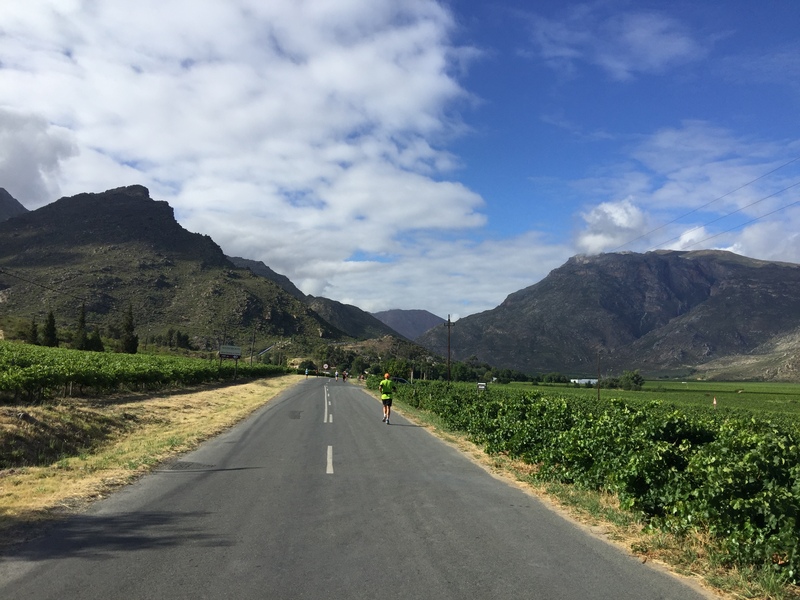 Aside from being the perfect excuse for a long weekend jailbreak, it’s also a great way to end your marathon running year before heading ‘back to work’ with boring double-lappers in January. 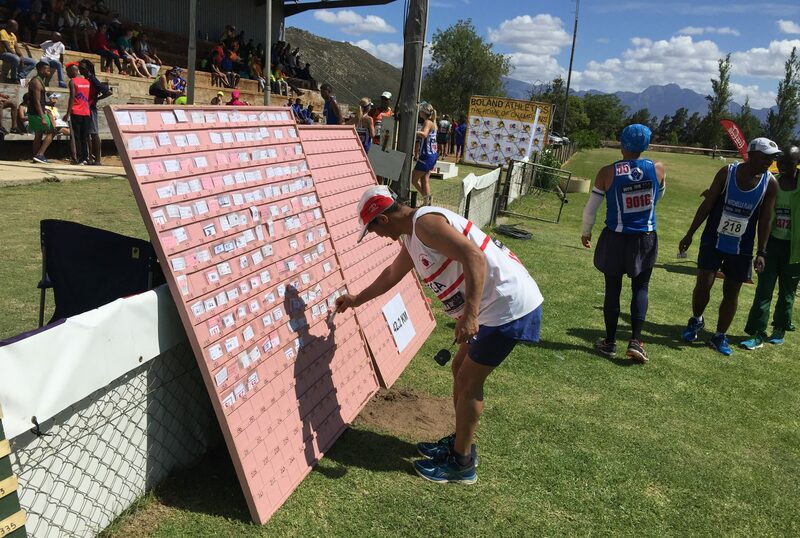 The race is usually held on the same weekend as the Cape Town leg of the international rugby sevens tour so, if you are planning to run the marathon and need a flight to get there, it’s advisable to book early. The good news is that the race has an early 5:30am start so there is plenty of time to shower and get back to Cape Town Stadium to watch the Blitz Bokke. 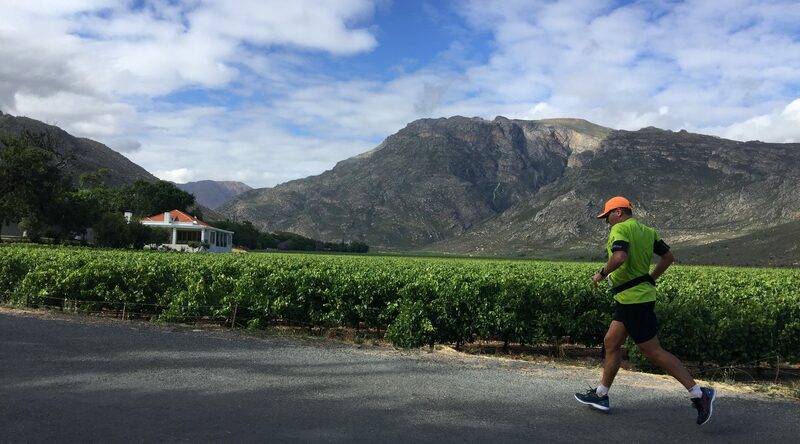 And if you’re not a rugby fan, spending some time exploring the wine farms and natural beauty of the Breede Valley region is highly recommended. For those not in a rush to get home you can take a quick dip in the prison pool. However, from what I’ve seen on TV, I wouldn’t recommend taking a shower there afterwards – prison soap is notoriously slippery and you could do yourself an injury bending over too quickly on tired post-marathon legs. Signing out from the Prison to Prison Marathon. 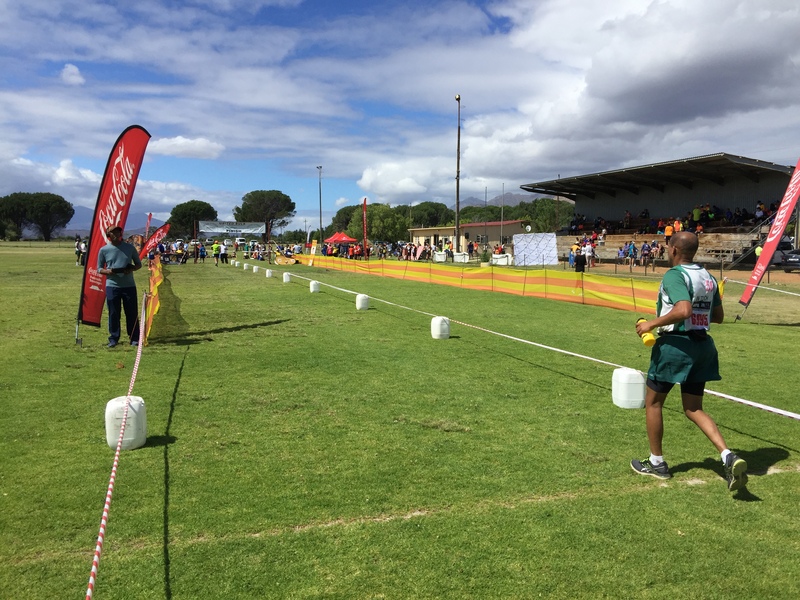 Look out for the first 2019 report – the Mielie Marathon in Welkom. Wow wow wow, such a great analysis of a beautiful race that has become a must do on my race calendar annually. Classic write-up as always. I always carry soap-on-a-rope when visiting a penitentiary, or the hostel accommodation on Somerset-East ;). 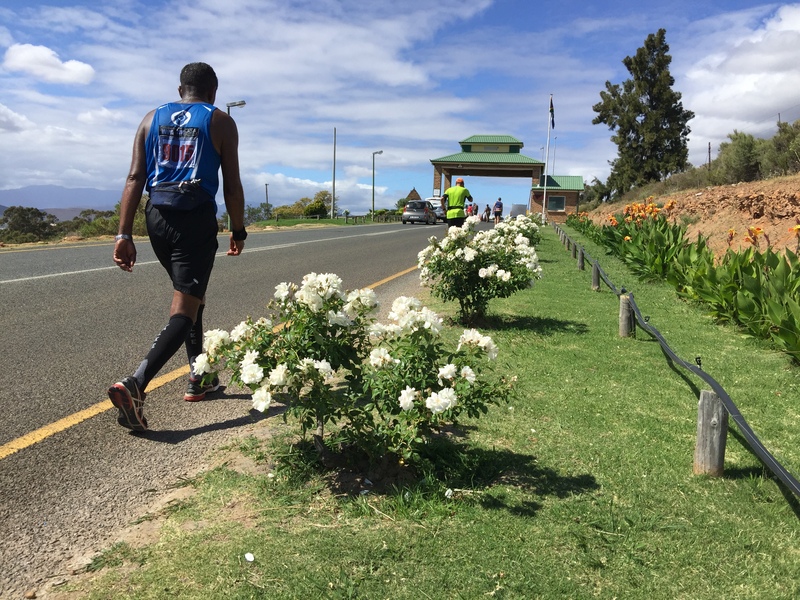 Just check your legs on the last stretch of the article, jy loop twee spore………….. Thanks Jeremy – and for picking up the typo! 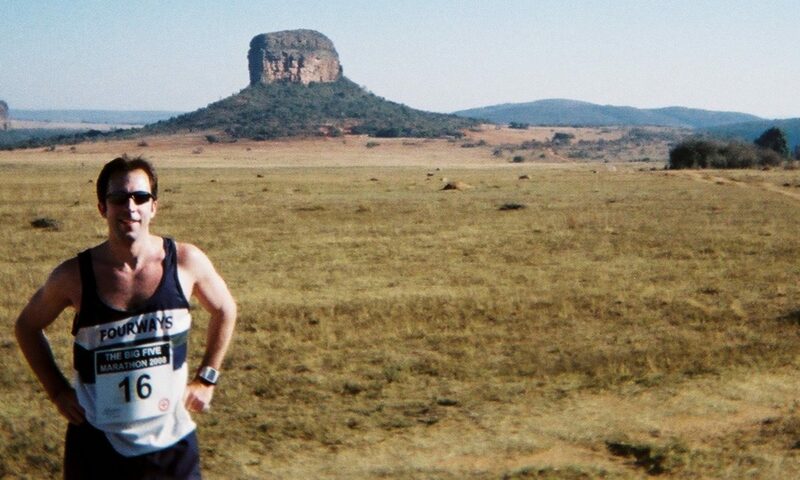 That last paragraph was a late addition to the article (after a comment by Paul Norris – the Shona Boy) and I wrote it straight after the Meerkat Marathon and obviously still hadn’t got my full mental capacity back yet! A brilliant read as always. I can definatly reccomend it as I once ran it. 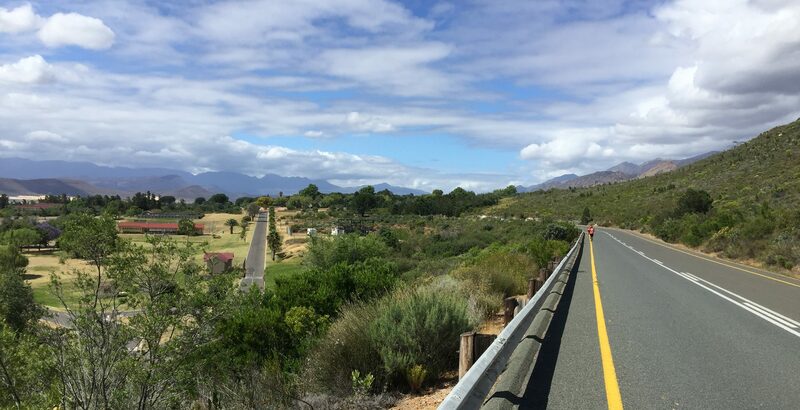 It started near George rugby stadium, then around the resovoire, across the original Kaimaans River bridge, and brings you out to the hill top over Wilderness, and then you gently run down to the Ebb And Flow camping site beside the Touws river. 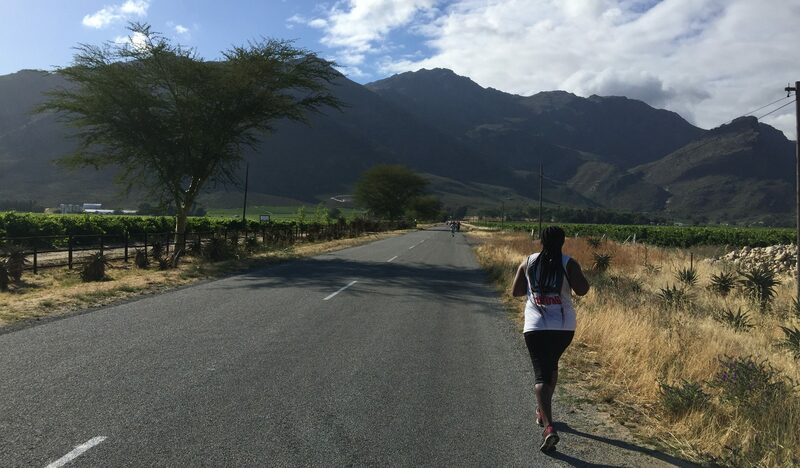 It is the most scenic marathon I have ever run. I presume they still use the same route.